Believers call Maitreya “The Loving One”, “Merciful”, “Invincible”, “the Sovereign of Compassion”, “the future Teacher of Mankind”, etc. Maitreya is the only Bodhisattva recognized by all schools of Buddhism. Bodhisattva is the one who has decided to become Buddha, i.e. being who has achieved the summit of spiritual development, in order to help other beings abandon the Wheel of Saṃsāra, the circle of endless reincarnations and sufferings. Maitreya is the coming Buddha and successor of Buddha Śākyamuni (Gautama Buddha), according to Digha Nikaya, one of the ancient texts of Tripitaka (“the Basket of Teachings“), containing over 17 thousand sutras ascribed to Buddha or his immediate disciples. 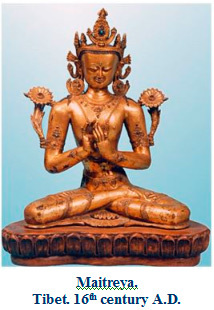 Chapter 5 of Lalitavistara Sutra, one of the most popular Buddha’s biographies in Buddhist literature, composed in 3-4th centuries A.D., says that, prior to descending to the earth from Tushita Heaven in order to become Buddha, the Perfect indicated Bodhisattva Maitreya as his successor and laid his own Bodhisattva crown on his head. The advent of Maitreya will be characterized by the decrease of ocean dimensions for Maitreya to traverse oceans easily. Moreover, the true dharma (law, teaching) will be disclosed to people, so that they could create a New World. Many centuries have passed, and Buddhists of all schools are waiting for future Buddha coming, which is evidenced by numerous Maitreya statues in temples, as well as by huge sculptures of him, graven in rocks near villages and dating back even to 350 B.C. 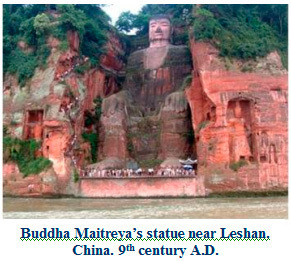 Thus, a statue in China is one of the tallest Buddha Maitreya statues on the Earth (71 m) and the highest sculpture in the world. It is graven in a solid rock at the junction of three rivers in Chinese province of Sychuan, near Leshan city. Buddha Maitreya’s head levels with the rock top, while his feet rest against the river. Works on the statue creation were carried out in the times of Tang dynasty, starting from 713, and lasted for ninety years. In line with an ancient tradition, Maitreya was often depicted sitting with his legs crossed, admonishing. Bodhisattva is usually dressed in Buddha monastic clothes. In the school of Gandhara (ancient kingdom that used to be located in the territory of modern Pakistan) Bodhisattva is crowned, dressed in royal clothing and holding a bowl with amrita, the drink of immortality. Other wide-spread image of Maitreya is when he’s depicted sitting, dressed in Bodhisattva clothes, with a crown on his head, in which crown a little stupa is placed. Legends say, when Maitreya was meditating in the Teacher’s form, disciples saw the Enlightenment stupa on the crown of his head. Thus, Maitreya is frequently portrayed with a stupa on his head. A later tradition depicts Maitreya sitting not in the oriental posture, but with his feet put down from a throne and ready for the advent (a “western” posture). 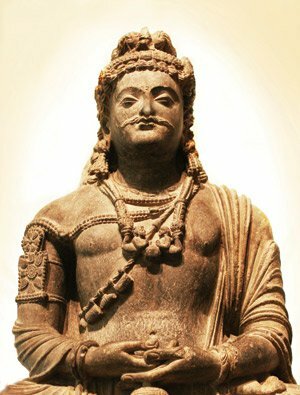 In Buddhist art of China, Korea and Japan of 6-19th centuries A.D. Maitreya was depicted half-naked, since bare chest was a symbol of power, crowned, on a lotus throne as a symbol of heavenly purity. A compassionate gesture of his right hand touching the cheek means tenderness towards people, whereas the movement of his foot descending from the throne expresses his readiness to offer help to sufferers and weak. 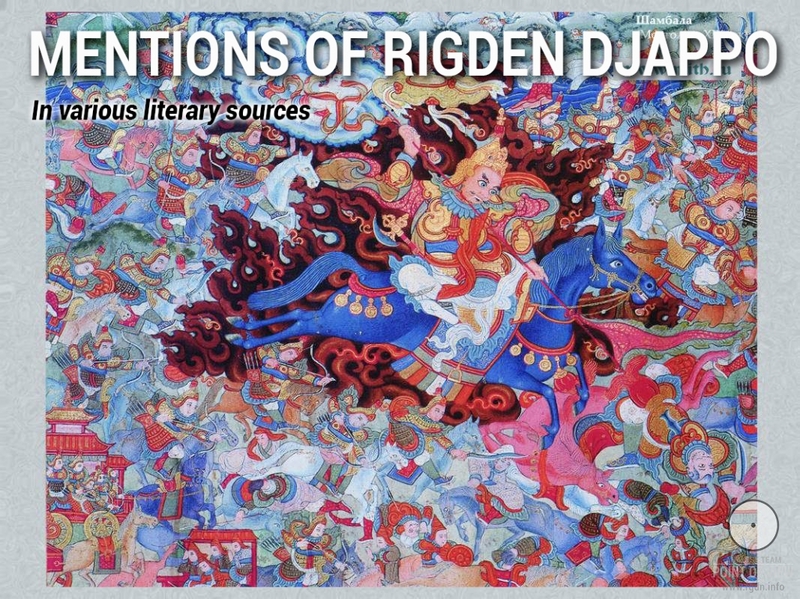 There are numerous portrayals of Maitreya on Buddhist thangkas. A thangka is a kind of Buddhist portrait painting executed in a special way. 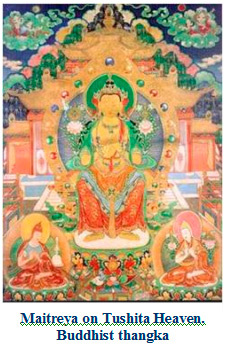 Maitreya is often depicted residing on Tushita Heaven, accompanied by Atisha and Tsongkhapa (two prominent thinkers and advocates of Buddhism). 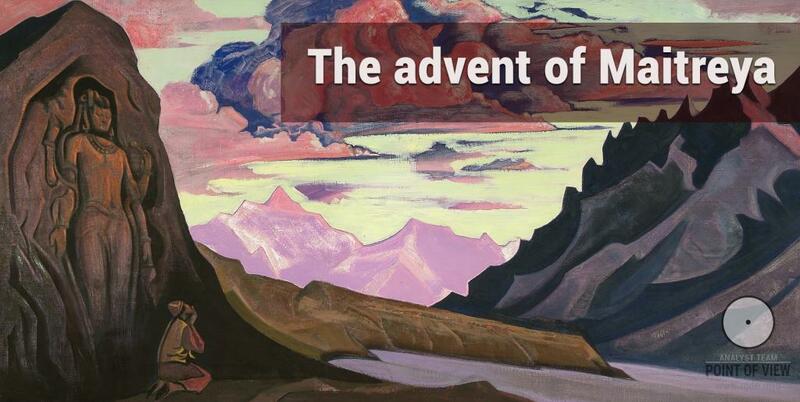 Among contemporary images devoted to Maitreya, the most famous are the series of paintings by distinguished Russian artist Nicholas Roerich. 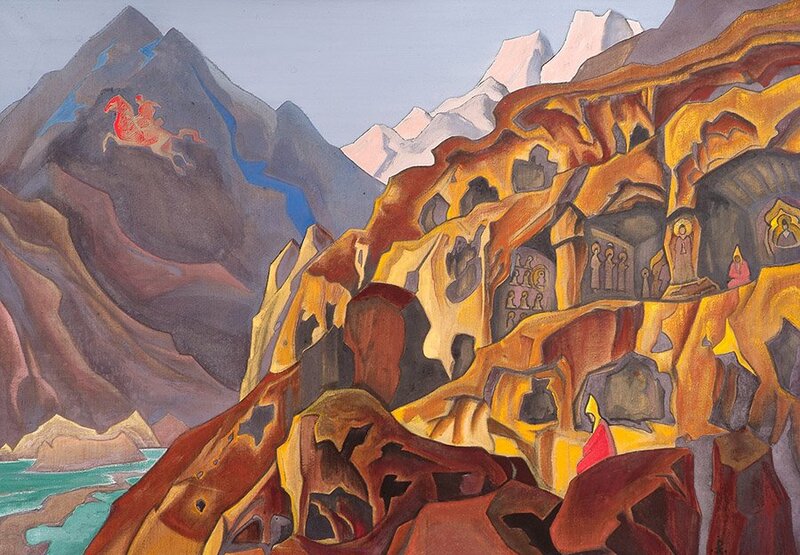 In the painting Maitreya the Conqueror artist depicted a majestic mountain view with a giant image of Maitreya. “Two arms stretched to the sky, as a call from distant worlds. Two arms stretched downwards, as a blessing to the Earth. 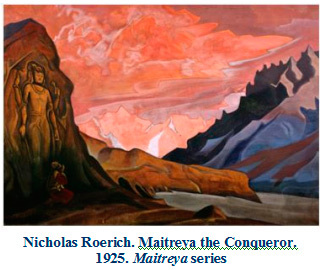 They know: Maitreya is coming”, this is how Roerich described ancient Maitreya relief graven in the rock near Maulbek. Let’s refer to the fragment of the book The Light of the Three Jewels written by two Tibetan lamas Khenchen Palden Sherab Rinpoche and Khenpo Tsewang Dongyal Rinpoche. It’s a story of a man who was a great Hindu scientist, but only thanks to true compassion he could be in direct contact with Teacher Maitreya. “Pure compassion has the power to eliminate all karmic burdens and obstacles on the way to enlightenment. When inner wisdom is revealed, your understanding of relative and absolute truth enhances, as you advance towards enlightenment. Buddha repeatedly said compassion was the most powerful weapon to eliminate ignorance and enhance wisdom. The story of Asanga well illustrates this. He was a grand Hindu scientist, born around five hundred years after Buddha, at the beginning of the Christian era. Young Asanga went to NalandaUniversity, the famous ancient Hindu monastery and first real university in the world. 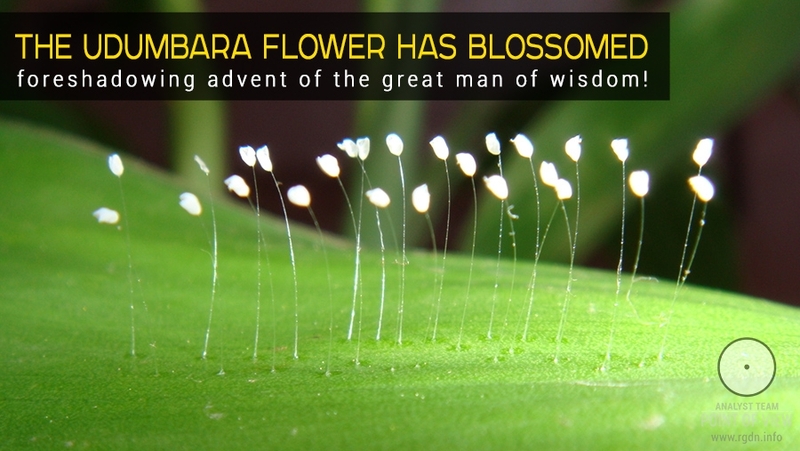 Although Asanga became a great scientist, he still had doubts as to certain teachings. He questioned many scientists and cognizant masters, but neither of them could dispel his doubts. He decided to practice visualization of Maitreya, the future Buddha, thinking once he sees Maitreya he will find answers to his questions. 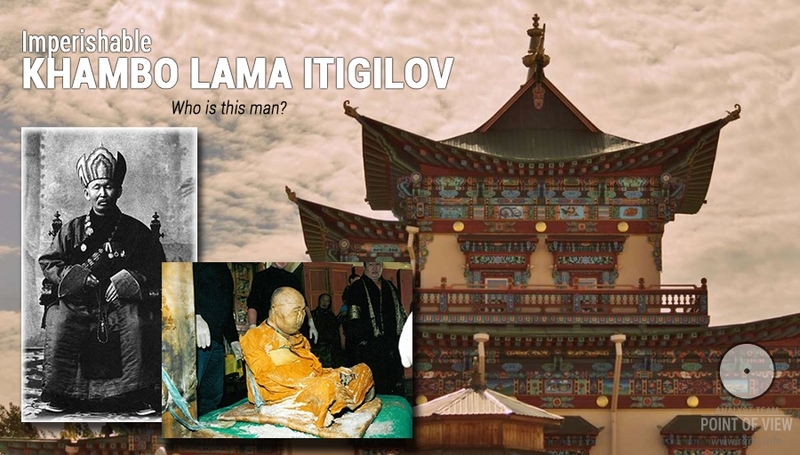 Having received initiation and instructions, he went to a mountain in India and meditated on Maitreya for three years. Asanga thought in three years he would have enough power to meet Maitreya and ask him questions, however by that time he received no signs. After three years he got tired and lost inspiration, and so he finished his retreat. Descending the mountain, he came to a village, where people gathered to look at an old man who was making a needle, polishing a big iron pole with a piece of silk. It was difficult for Asanga to believe somebody could make a needle by polishing an iron pole with a piece of silk, but the old man persuaded him it’s possible and showed three needles he had already made. When Asanga saw such an example of great patience, he decided to continue his practice and returned to retreat for three more years. During the next three years he had several dreams about Maitreya, but he still couldn’t see Maitreya. Three years passed, and he felt tiredness and decided to leave again. Descending the mountain, he saw a place where water was dripping down on a stone. It was dripping very slowly, one drop per hour, but already made a big hole in the rock. Having seen that, Asanga gained courage again and decided to go back to his retreat for other three years. This time he had nice dreams and other signs, but he still couldn’t see Maitreya clearly and ask him questions. He left once again. Descending the mountain, he saw a little hole in a rock. The spot around the hole was polished by a bird that was rubbing her wings against the stone. This made him decide to go back to his cave for three years more. However, even after three more years he still couldn’t see Maitreya. After twelve years he had no answers, therefore he abandoned his retreat and went down the mountain slope. On the way he stumbled across an old dog near a village. When it barked at him, Asanga saw the lower part of its body was all in wounds and covered with fleas and worms. Having come closer, he saw the dog was suffering terribly and felt great compassion to it. He recalled stories in which Buddha Śākyamuni had given himself to living creatures, and decided it’s time for him to give his body to that dog and insects. He walked to the village and bought a knife. With this knife he cut meat from his thigh, intending to take worms off the dog and place them on his flesh. Then he grasped that if we took insects with his fingers they would die, because they were very fragile. Therefore, he decided to remove insects with his tongue. He didn’t want to see himself doing that, and so he closed his eyes and stretched his tongue towards the dog. However, his tongue touched the ground. He tried again and again, but his tongue kept touching the ground. Finally, he opened his eyes and saw the old dog vanished, and there was Buddha Maitreya instead of it. Seeing Buddha Maitreya, he was very happy and somewhat upset at the same time. Asanga had practiced for so many years, but Maitreya came to him only when he saw the old dog. 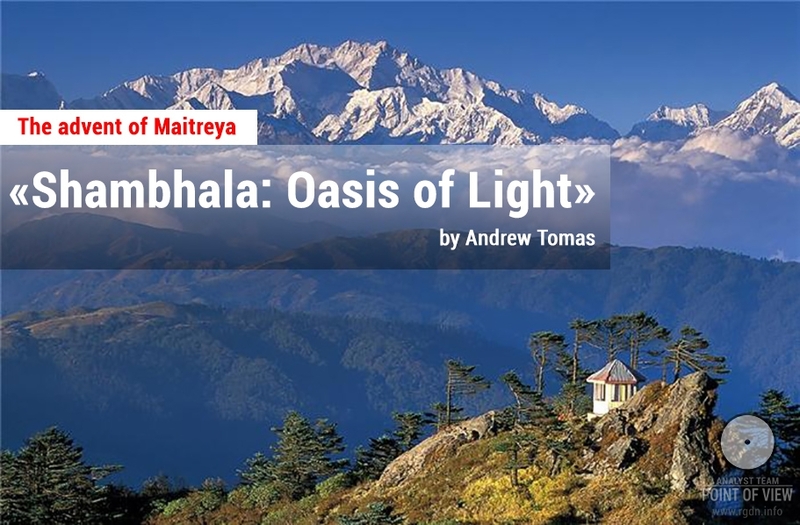 Asanga started crying and asked Maitreya why he hadn’t shown himself earlier. Maitreya responded: “I was never uncompassionate to you. Since the first day you entered the cave, I’ve always been with you. Yet, up until today sorrow has been overshadowing your eyesight. Now you see me thanks to your great compassion to the dog. Compassion has removed your sorrows to such an extent that you can see me.” Thereafter, Maitreya personally taught Asanga texts, which are known as the Five Teachings (Treatises) of Maitreya and considered very important in Tibetan tradition. Asanga’s contact with Maitreya emerged from compassion. Only owing to compassion, Asanga’s burdens and sorrows vanished. That’s why Guru Padmasambhava taught that Dharma practice without compassion would bring no fruits, saying: “in actual fact, without compassion your practice will become rotten”. 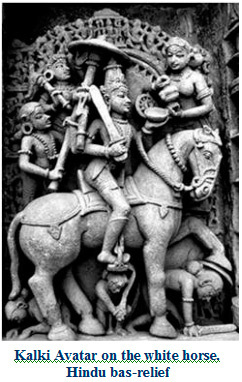 The author further presents ten legendary avatars of Vishnu, including his seventh incarnation, Rama-Chandra (approximately the 7th millennium B.C. ), the hero of ancient Hindu epic Ramayana, and his eighth incarnation, Krishna (the 4-3rd millennium B.C. 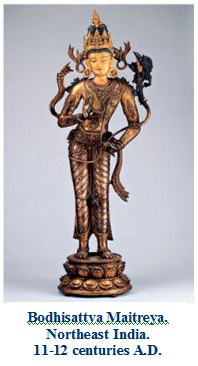 ), one of the most popular Hindu gods. As stated above, the incarnation of Vishnu as Maitreya will be the tenth. Parāśara received Vishnu Purana from his Teacher Pulastya, one of the seven mind-born Sons of Brahma. Brahma is an Indian god of creation, one of the Trimurti gods (Hindu “Holy Trinity”) along with Vishnu and Shiva. Through dialogues between Parāśara and his disciple Maitreya, The Secret Doctrine highlights the foundations of ancient cosmogony and its conformity to the Secret Teaching. 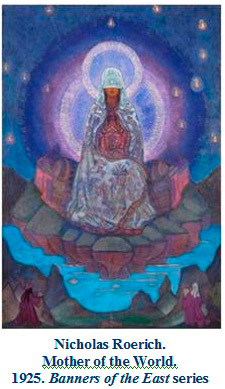 The first secret knowledge was disclosed through Helena Blavatsky, a disciple of the Mahatmas of Shambala, and the Theosophical Society, but afterwards the teaching was enhanced and published in the books of Agni Yoga (Living Ethics) by Helena Roerich. The Teaching of Fire as the New Testament to Earth was given by the “Great Master M.” on the threshold of the transition to the Epoch of Fire. “The Sovereign of Shambala reveals three Doctrines to humanity: the Teaching manifested by Maitreya summons the human spirit to Our creative world; the Teaching of Maitreya ordains the infinite in Cosmos, in life, and in the attainments of the spirit; the Teaching of Maitreya guards the knowledge of the Cosmic Fire as the unfoldment of the heart that embraces the manifestation of the Universe. The Epoch of Maitreya is also the Epoch of the Mother of the World in the Teaching of Living Ethics. “It will be asked: “Why this time is called the Era of the Mother of the World?” Truly, it must be so named. Woman will bring great help, not only by bringing enlightenment, but also by affirming equilibrium. At times of confusion, the magnet of equilibrium is disturbed, and free will is needed to reunite the broken whole. Maitreya, the Compassionate One, needs co-workers. Those who sacrifice themselves for the Great Era will reap an abundant harvest. Another sign of the New Era will be cooperation. “Cooperation in everything will be added by Maitreya’s age. Not only by command, not just by harmony, but by the lightning-bolt of directed thought are the co-workers united.” (Signs of Agni Yoga, par. 101). Maitreya has come to teach to act, bringing Light into his every action. “All preceding Yogas given from the highest sources took a particular aspect of life as their basis. Now, at the dawn of the age of Maitreya, a Yoga is needed that would comprise the essence of life in its entirety, all-embracing, evading naught. One remembers the example of those unignitable youths in the biblical legend who valiantly sacrificed themselves to the fiery furnace and thereby acquired power… where there is fire, there is clear evidence of progressive perfectment.” (Signs of Agni Yoga, par. 158-159).